State Dinners: each administration has their own style. The Clinton's were known for their large events, while the Bush's preferred smaller gatherings. The White House will give us a preview of tonight's festivities later today, but already the Obama's are putting their stamp on a national tradition which dates back to President Grant. Although almost everything about it is a closely guarded secret from who's invited to what's on the menu. CBS News correspondent Nancy Cordes got a sneak peek. Everyone wants one, but only a few hundred are lucky enough to get an invitation to the hottest ticket in town. 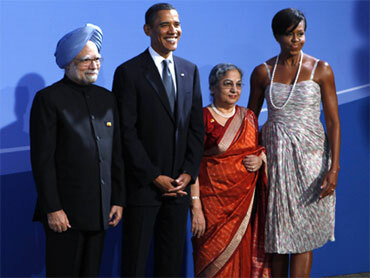 The guest of honor is India's Prime Minister Manmohan Singh and his wife, Gursharan Kaur. Many of the details are still hush hush, but the evening is expected to be a mix of Washington heavy weights, staff members and Hollywood big wigs. Expected to attend Secretary of State Hillary Clinton, but not her husband former President Bill Clinton, House Speaker Nancy Pelosi and Louisiana Governor Bobby Jindal. From the entertainment world, likely guests include Obama fundraisers, Steven Spielberg, Ari Emanuel and filmmaker M. Knight Shyamalan. The Obama's chose to host the event on the South Lawn under a white tent, which can accommodate close to 400 guests. While no one is giving a price tag on this dinner, previous state dinners range anywhere from $60,000 thousand to upwards of several hundred thousand dollars. "It's larger than Bushs' official dinner in 2005, where they had about 150 people there, but smaller than the Clinton's dinner, which had about 700 people there, so they're splitting the difference," said Politico reporter Nia Malika Henderson. Also part of the Obama style - celebrity chef Marcus Samuelsson will help prepare the menu which insiders say will not be traditional Indian fare, but may tip it's hat to the guest of honor. It will likely include herbs from the White House garden and a dessert sweetened with local honey. Pop entertainer and Chicagoan Jennifer Hudson will entertain the guests giving everyone, including the Obama's ample opportunity to dance. Planning a party for world leaders at the White House is no small feat, something that Laura Schwartz knows more than almost anyone else. The former Special Assistant to the President and The White House Director of Events for the Clinton Administration, dished on what goes on behind the scenes to plan such an elaborate affair with Early Show co-anchor Maggie Rodriguez. The Obamas want this dinner to make a statement at home and around the globe. "Well, I think this is their first State Dinner, so they are inviting the world into their home by way of the Prime Minister of India and it really is the time to put that outstretch hand of America here at home," Schwartz said. "The Obamas have been traveling quite a lot this first year, which is very exciting. It's good for America. It's good to be involved. But this is the first time these honors are given here at home. The people's house right behind me," she added. "Is it customary to honor the guest of honor - in this case the Indian Prime Minister - with the food or in another way?" Rodriguez asked. "Absolutely. What happens, about two months before now, one of the delegation members have come over from India, they sit down, they talk about the likes and dislikes of the Prime Minister and the spouse," Schwartz said. "Any food allergies. In this case the Prime Minister is a vegetarian." "And then the White House wants to highlight the best of America," she continued. "So they're bringing Marcus Samuelsson into work with the White House chef, Christina Comberford, who is fabulous in her own right and she still will oversee the entire dinner. But Marcus Samuelsson will definitely add a little zing."